West Indies left-hander Shimron Hetmyer goes on the attack against India. PUNE, India, CMC – Left-hander Shimron Hetmyer has already been tipped by India spin legend Harbhajan Singh to be the next million-dollar buy in the Indian Premier League but the batting star says even though playing in the IPL is in his future plans, representing West Indies is his only focus at the moment. The 21-year-old smashed a 78-ball 106 in the opening One-Day International in Guwahati last Sunday, prompting Harbhajan to label him the “next million dollar baby in the IPL” on Twitter. “It’s a good feeling to know that one of the great spinners from India has rated me that high,” Hetmyer said. 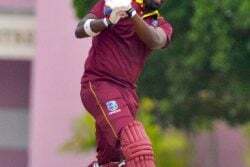 Hetmyer endeared himself to the Indian fans with his scintillating strokeplay, lashing half-dozen fours and sixes to mark his third career ODI hundred and third this year alone. He followed up in the second ODI in Visakhapatnam with a high quality 94 off just 64 balls with four fours and seven huge sixes, once again reiterating his form in the shorter format. Hetmyer struggled in the preceding two-Test series with 50 runs from four innings and said he had put that experience behind him. “I had a bad Test series. It was not one of the best ways to start a series in India but from there on I tried to forget about that as much as possible and the senior guys helped,” he explained. Hetmyer has played just 14 ODIs after making his debut last December on the tour of New Zealand but amazingly has been selected for just two Twenty20 Internationals.